TTD provides a real-time bidding platform, which enables advertising agencies to bid for and purchase multi-channel online ads. A recent IPO in the “Online Advertising Management” area of the internet/e-commerce sector. This company helps businesses advertise with a platform on which they can send personalized messages to consumers in order to improve the efficiency of their promotional efforts. This direct to consumer advertising access model is very efficient and gives a high ROI to their customer base. The first quarter as a public company came in strong with 3rd quarter sales being up 84% to $53.0 million. Operating margins are 28% of sales. The company takes a cut of the value of advertising revenue from their customers of 15-20%. They are looking for $62 million in revenues in the 4th quarter, which would be up 45% year over year. We suspect they are being conservative here. With 38 million shares o/s the stock trades at just over 4 x Price to Sales ratio. As they say in their conference call transcript there is a 650 Billion opportunity to attack. The Price to Earnings ratio is about 25x our estimate of 2017 profits but that may be low. Given the growth rate of likely 50%, the PE to Growth rate qualifies as reasonable given what the market is paying for other tech names. We like the base pattern and the lack of interest from investors right now, which we think could change as we approach 4th quarter earnings results period if not sooner. A nice POST IPO base pattern, with decent upside and reasonable downside risk in a strong growth sector of Technology. 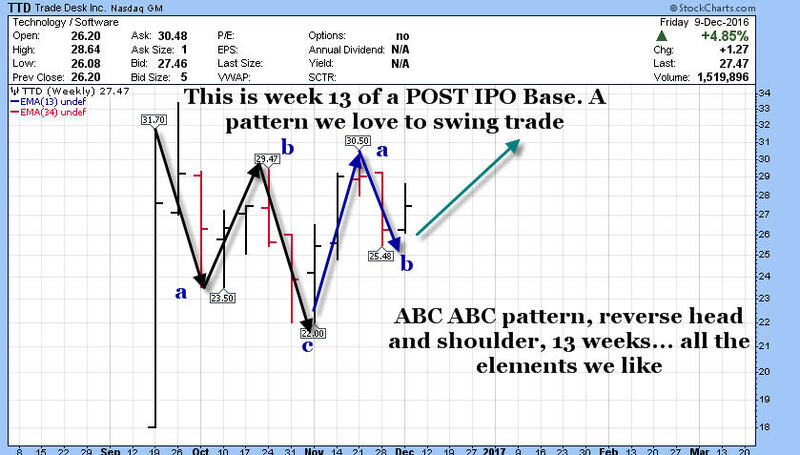 This is week 13 of a Post IPO base, we have a nice ABC ABC pattern developing, a Reverse head and shoulder pattern, and investors have lost interest. Usually the best time to enter.